The first officially designated fly fishing trail in the U.S. is right here in Jackson County, appropriately titled the Western North Carolina Fly Fishing Trail. Although these waterfalls are beautiful, they can also be very dangerous. Hiking near the top of waterfalls is not recommended. Please treat them with great respect. Directions are given from the intersection of Hwy’s 107 and 64. 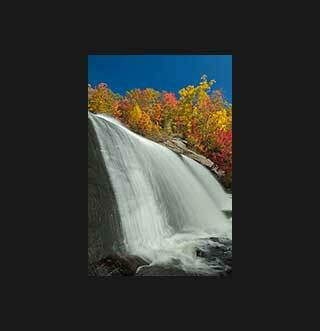 This 411 ft. waterfall is higher than Niagara Falls and is the highest waterfall in the eastern US. It is approximately 13 miles from Cashiers. 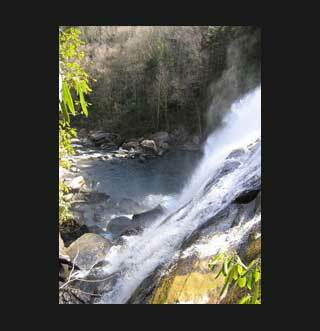 Hiking trails take you to the top and bottom of this fall, but hiking is not necessary to view this waterfall. Hiking to the top is not recommended as several people each year have fatal or near fatal falls. Follow Hwy 107 South about 10 miles. You will cross NC/SC state border. 1 mile past the state line turn left on Wigington Rd. Go 3 miles; at stop sign turn left. Marked parking area for Whitewater Falls will be about 1 mile on right. 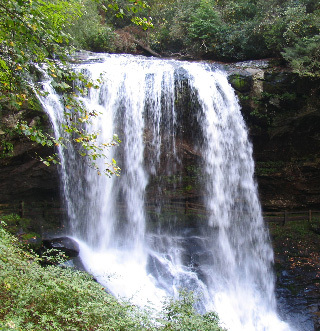 These 3 falls are located on the Horse Pasture River continuing on Hwy 281 about 6 miles past Whitewater falls. A paved pull off area will be on the right. Just over the guardrail are the trails leading down to the river. They are fairly steep, but level off once the river is reached. From Hwy 64 East turn right onto Hwy 281 just past the Sapphire Post Office. The pull off area will be to the left about 1.5 miles. Remember Hwy. 281 creates a loop between Hwy’s 107 & 64. Round trip is approximately 25 miles. 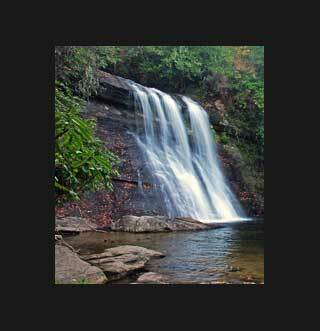 Located approximately 14 miles from Cashiers on Hwy 64 East. The Hwy passes over the fall which cascades approx. 123 feet under the small bridge. Parking is limited and the waterfall is not easily seen by merely driving by. No hike involved. 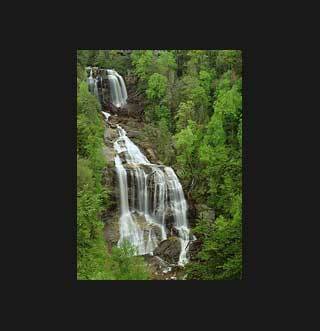 Located on Hwy 107 South, about 4.2 miles from Cashiers. It is a 40-foot cascade that falls into a pool of chilling water. A great place to swim and picnic. It is necessary to walk a short distance to get to the fall. 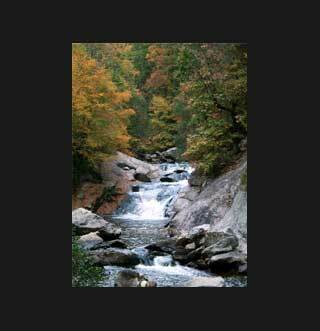 Nature’s waterslide on the Chattooga River. Perfect for smaller children. About 1.5 miles on Hwy 107 South. Turn right onto Whiteside Cove Rd. Approximately 3 miles into Whiteside Cove you will come to a small bridge. Pull over to the right and the very short trail will be visible. Hurricane Falls Take Hwy 107 North 1.5 miles. Turn left into Norton Community. About .5 miles you will cross a bridge and just beyond the bridge on the right will be a pull off area where you can view this waterfall which empties into Lake Glenville. No hike. Take Hwy 64 West 10 miles into Highlands. Turn right and continue on 64 West for 3 miles. The falls will be on the right. Years ago the original Hwy. was routed behind the waterfall and you can still drive under it today. No hike involved. Just past Bridal Veil Falls on 64 West. The parking area will be on the left. Stairs take you down into the Cullasaja River Gorge and a short path takes you behind this waterfall. Cullasaja Falls Past Dry Falls on the left side of Hwy 64. This waterfall is below and parallel to the road in the Cullasaja River Gorge. It is not easily visible from the road and parking is limited. No hike involved.